I want to share with you a really fun rainbow manicure I wore several weeks ago, created with all sparkly Zoya polishes! 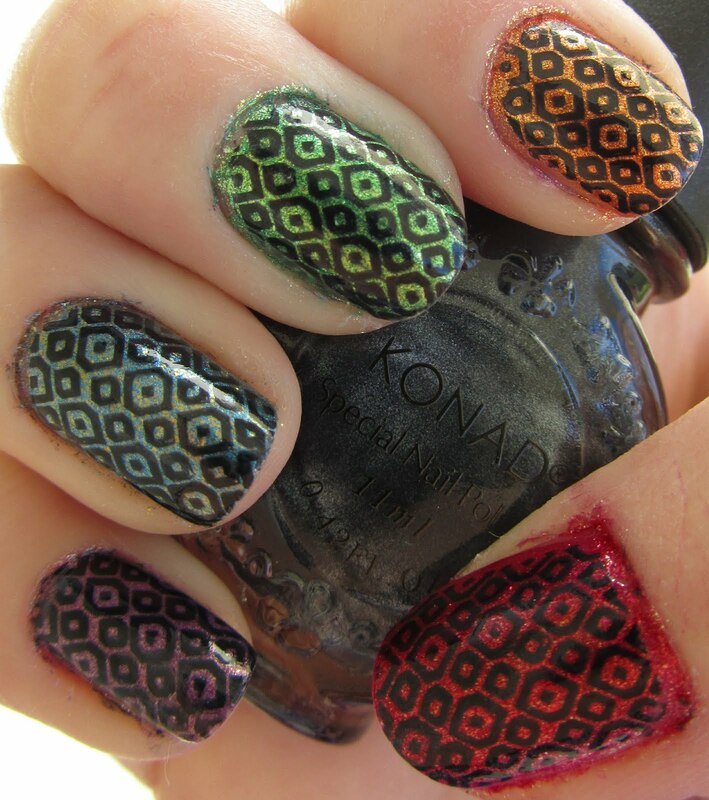 For these nails I used Zoya Reva, Zoya Tanzy, Zoya Apple, Zoya Crystal and Zoya Danii. I used three coats for all but Reva, which only required two coats. Almost all of these polishes have been reviewed elsewhere on my blog, but I am sure you are all aware of how sparkly and gorgeous these all are! 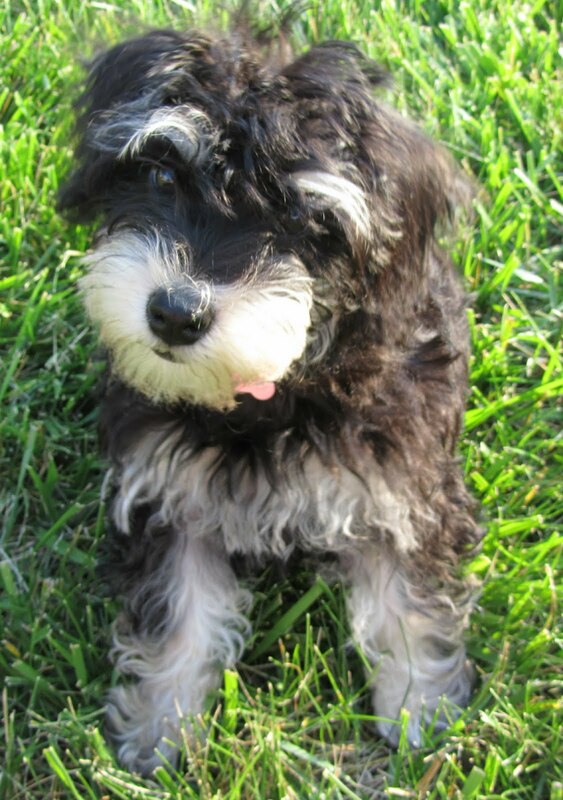 Dan and I have been having an emotionally rough week... we are trying to decide whether we should keep Nova or give her to my in-laws. We absolutely adore her but we are worried we will not have enough time for her when we go back to med school/residency (think: 80 hr work weeks). They love her, she and their dog get along amazingly and she is so happy there. It is tough to decide, especially since I know I need to put her best interests ahead of my own... it is a very tough decision. We are on "trial separation" right now and I miss her like crazy. Any advice? 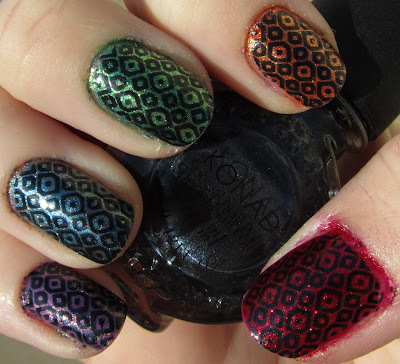 On a happier side here is a simple fauxnad from a few weeks ago with OPI Sparrow Me the Drama. After two coats of the base color, I used Bundle Monster plate BM12 and Zoya Areej to create the flowers. I really like the pink combo here! A cute and simple mani, perfect for summer. I am sure most of you have seen this gorgeous collection by now, but for those who haven't or who want a second look, here it is! This fabulous collection of cremes and a silver sparkly shatter were released to coincide with the new Pirates of the Caribbean movie - which I still have not seen but would really like to! While some say this collection doesn't really "fit" with the Pirates theme I disagree - these totally make me think of sailing out on the open sea and mysterious tropical islands! All colors shown with no base coat, with top coat. 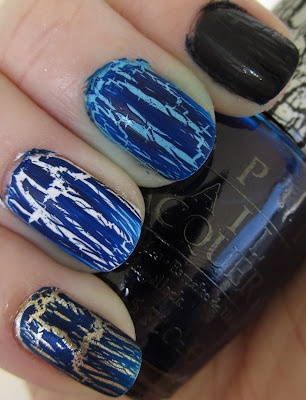 No top coat on the shatter pictures (although you will want to use a topcoat for normal wear). A pale ivory creme. Three coats, very nice application - which I was a bit worried about with how light it is. 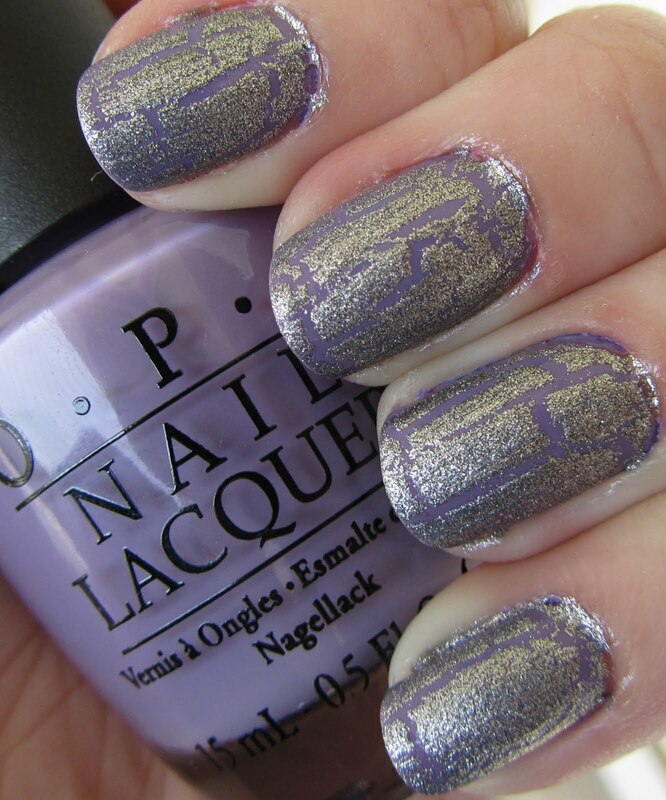 This is a really gorgeous neutral! With Silver Shatter. 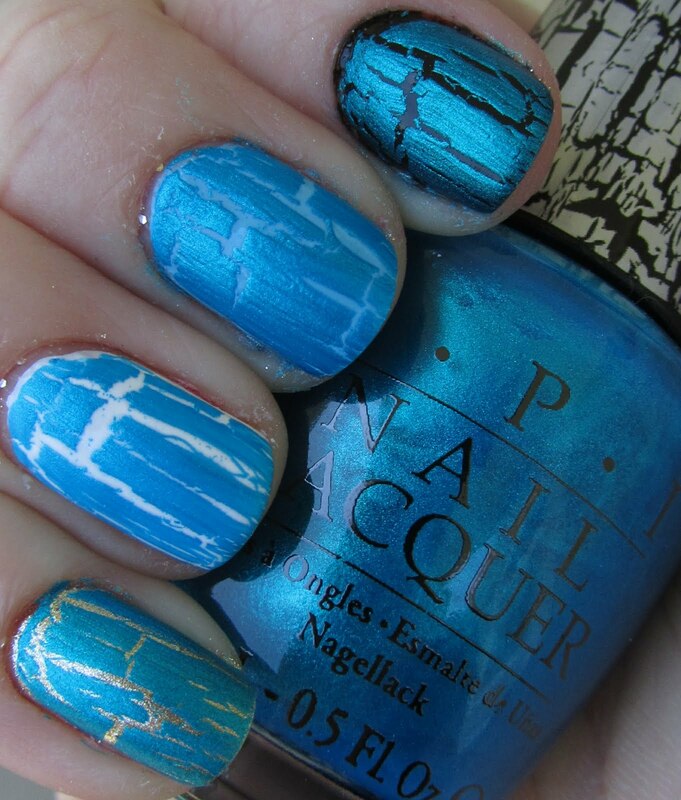 This polish is a bit too pale to really pop under the shatter. Pale sage green creme. I wasn't so sure about this color at first but I really love it on! This one also took three coats for a full opaque finish. With Silver Shatter. Still a bit pale in my opinion for this duo. With Silver Shatter. Starting to get a bit more contrast between the base and the shatter, so I am starting to like it more and more! Bright... yet somehow dusty.. pink creme. I really like this color - there is something about the color that makes it bright but not too bright and in your face and it is bold and just very pretty. Yea that makes no sense, I know, haha. But it is a very pretty pink. Two coats here. With Silver Shatter. Really starting to love these combos! I think the silver really pops over this one. Medium purple creme. This has a lot of blue tones in it. Very pretty dusty pastel color. Two coats. 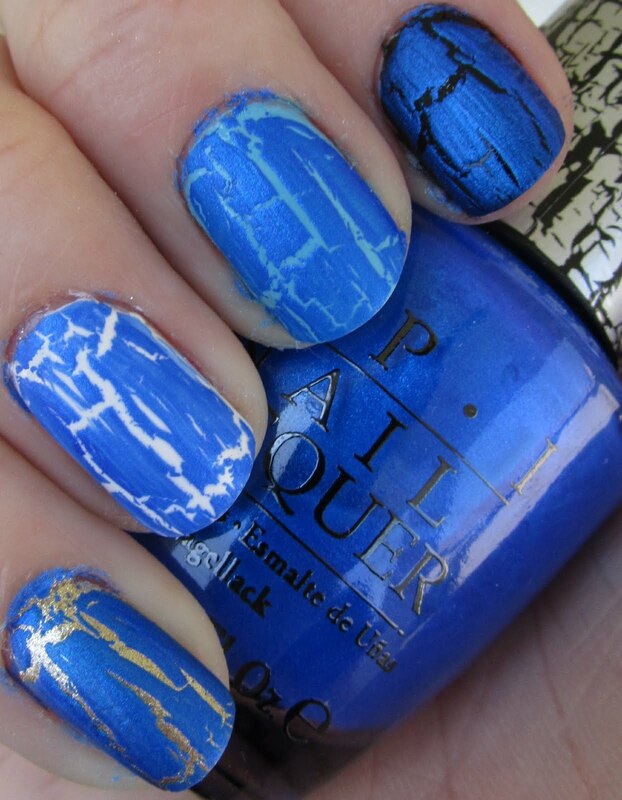 With Silver Shatter. Love this combo as well! Dusty turquoise creme. I also liked this one quite a bit. Two coats. I really like this collection - I find the collection of muted dusty pastel cremes to be rather unique in my polish collection. And I love Silver Shatter - it is probably my favorite shatter from OPI yet! While it loses its impact a bit on the lighter colors it looks really great over some of the bolder colors of the collection. I can't wait to see how it will look over some other darker colors as well! Overall this was a really great collection, and I loved pretty much every polish in it! There is something about a nice collection of cremes that is so simple and pure and satisfying! So I am back from my vacation and ready to spend some serious time on this lovely little blog. First off, I just want to say a big THANK YOU to all of you wonderful readers and followers - I just hit 700 followers, yay! I am very excited that my little blog has taken off so well, and I couldn't have done it without you! Thanks to all of you who entered the giveaway! I will most likely be holding another one sometime soon! That is all for today but I am going to spend a lot of time tonight and tomorrow getting a bunch of posts ready to go. I have a lot that is almost ready to share with you, such as various new collection swatches and reviews, comparisons, lots of nail art, some tutorials, and a review of the last 18 days I spent wearing CND Shellac! I am going to plan to start preparing posts on the weekends and have them auto-publish during the week, so that I don't run into these time crunches and go so long without postings. Thanks for all of you who have kept coming back even after a couple of long breaks! You guys are awesome!